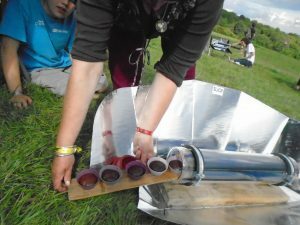 Solar cooking at the Green Gathering. We planned to build on the previous year with all kinds of ideas and small events planned. 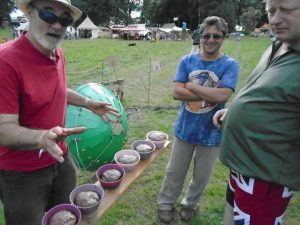 Its a four day festival of all things green and a fantastic, idyllic location. 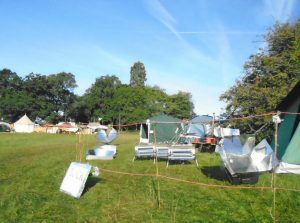 The festival is a large event run mainly on renewable power, meaning its subject to the weather. It rained the first two days, with bags of wind. The next two days were lovely with loads of sun, cloud too. Reasonable odds I guess, ‘oh to be in England now that summers here’ (Wales actually)?. 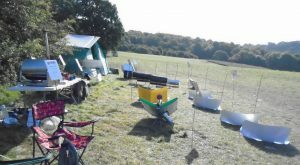 So we were hampered but we managed plenty of action – even during the rainy bits. 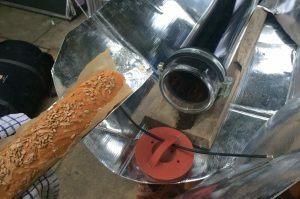 It was on a mostly sunny day we inaugurated the ‘Great British Solar Bake Off’. 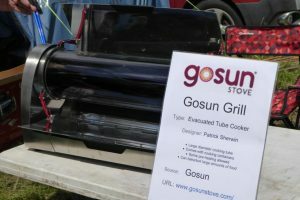 In the right corner – the GoSun Grill , a big hitter from the US of A. In the left corner – the Low Sun Gorilla a lumbering beast from the jungles of England. In a moment of calm twixt wind gusts I’d set up a cake mix ready for action, loading up the limey while the colonial contender warmed up for business. At some point later (when i remembered) the cakes got slammed down its hot, hungry mouth. Whack! For For an hour and more our two challengers circled (around the sun) with the occasional sharp movement (into solar focus), Kapow! 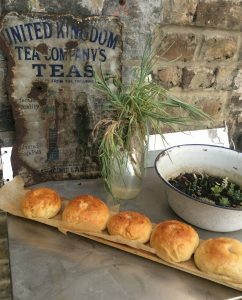 Our clashing cookers sweated and steamed in the sun, nothing blew over, spectators cheered, clouds swept in. All while we did some other stuff (its not exactly high maintenance). 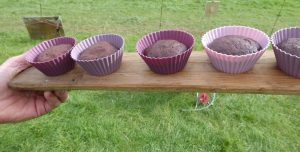 Our dedicated cake testers were drawn from passing crowds on the main pathway to stage one. 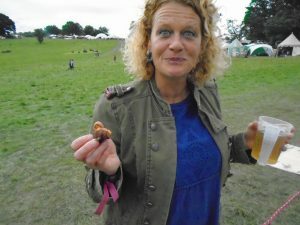 Something free at a festival? no problem. 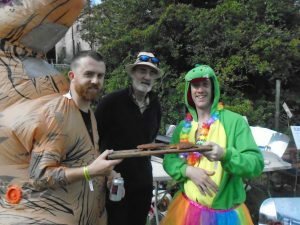 Our judges were finely tuned taste and texture experts, but with little to no knowledge of solar baking. Look at these faces…the drama is palpable, you could cut the cakey atmosphere with a knife. So the moment of truth came in the clash of titans (please excuse the hyperbolics). The verdict was out. 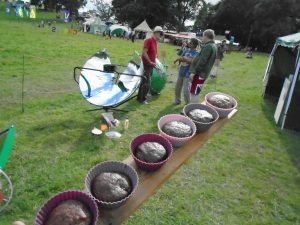 Who was the winner of the Great British Solar Bake Off? Tasty, brown, well textured and juicy the cakes of the mighty GoSun Grill took the trophy. The British cakes were too burnt. King Alfred wept a tear as the Low Sun Gorilla stumbled home (not far), battered and bruised, down but not out, to try and try again. 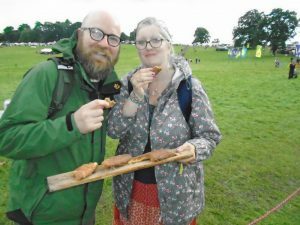 See you next year for the next British solar bake Off 2018. This entry was posted in Ecozoom UK on November 7, 2017 by ecozoomuk. Like all things solar you want to start early. In our case the night before. 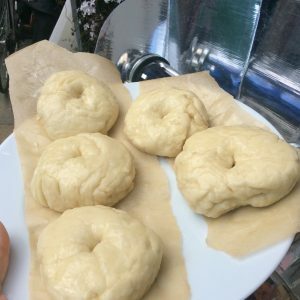 Mix your living yeast with flour and all other ingredients. Follow your own recipe, I have mine, it changes. Cover and leave your mixture overnight to rise (you know you’ve got sun tomorrow, right?). 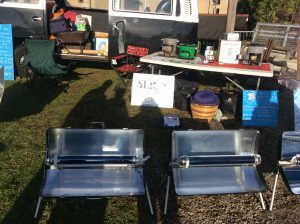 Morning…now you want to catch all the rays so set out your Gorilla Sun Oven early, it will do a slow warm up in the weak morning sun. With a bit more flour knock back your dough and shape. 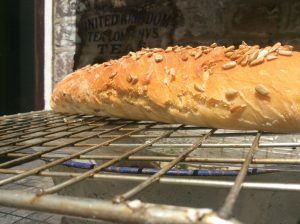 Its got to be oven sized – baguettes, bagels, baps – whatever you can get in there. Let it rise for half an hour or so. Make sure you can lift it easily, to transfer onto your hot baking tray for a quick insert, I use baking paper for convenience. 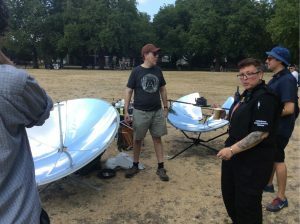 Now for some solar cooking theory. This is not a fuel hungry wood-oven with hot stones and excessive heat. Its a glass tube. A very special glass tube. Protected by a super insulating vacuum the inner wall gets plenty hot from the sun, but theres not a lot of wall. It heats the air inside and also conducts to what you’re putting in. You have to conserve the heat because it takes time to warm up. The distance from the sun is 93 million miles, and then clouds get in the way, so don’t expect miracles! 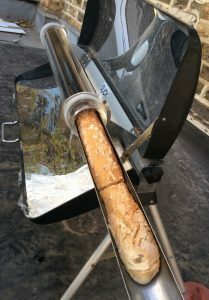 Quick as you can, pop the bung, remove the hot tray and carefully position the bread. 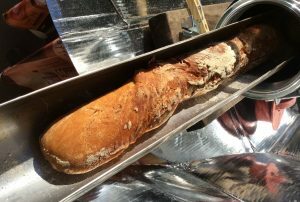 Bear in mind it will rise further in the tube (‘bread spring’). Get it back in and secure the bung, which needs to remain loose but not fall off, repeat ‘not fall off’. Now relax, go swimming, hot yoga, sunbathe, whatever you do. Don’t be tempted to look inside, don’t waste heat – its just the sun, it needs your help. Do nothing. Or if you want, adjust it after an hour by keeping the long axis at right angles to the sun. 5 seconds work, max. 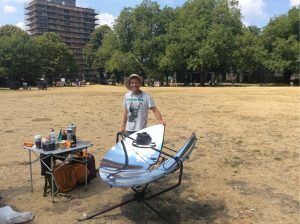 Disclaimer: This method only works with a solar vacuum tube oven in our UK sun. Times approximate. 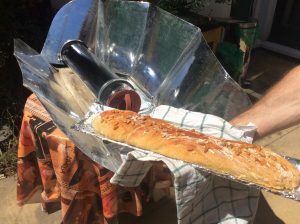 I’ve tried most other solar cooker types here and they just don’t cut it yet, for this application. 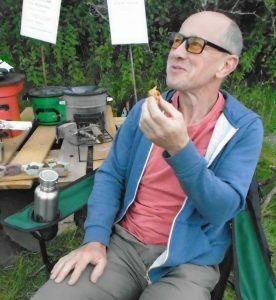 Pictures taken and bread baked between December 2016 and June 2017 in London, UK 51’30 North. 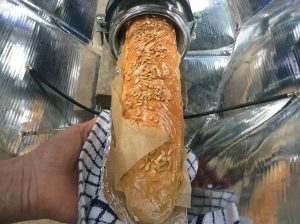 Visit our shop section if you’re interested in a tube or other cooker. Help spread the word! SLiCK were invited in mid November to the Pivotal event at the Cambridge Museum of Technology. Watching the forecast we confirmed attendance a few days ahead, not knowing what the expect. It turned out to be a sunny Autumn day. The venue was an atmospheric Victorian pumping station on the River Cam. 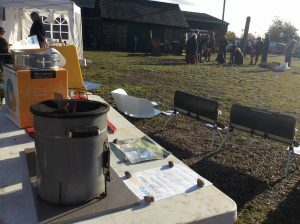 Our ‘solar cooking window’ was short with solar mid-day around 11:00am and low sun angles. 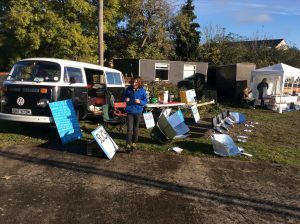 I’d no experience of doing a demo at this time of year and like most solar cooks I’m still finding my way about. Hungry for sunbeams I set up early. Look at those shadows! It was pretty cold, around 6°C – much of the event was held indoors in the museum or its out-buildings. Outside we had a great spot with direct sun. 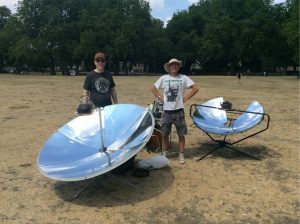 Solar cookers take time to warm up, unlike powerful fossil fuel using devices. 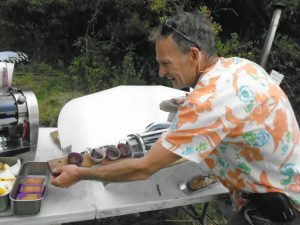 I also needed a warm up and was grateful for my small display of rocket cookstoves, keeping an Ecozoom Versa on all the time. Combined with the sunshine and the warm reception, this kept things very pleasant indeed! 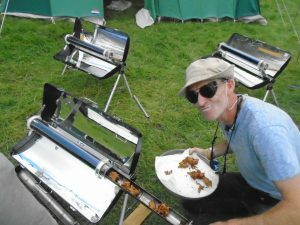 I’d pre-made some bhajis/pakoras to reheat in the evacuated tube cookers ( SLiCK SM70’s) and handed these out to visitors, careful not to lose too much heat as the spicy smell wafted around. 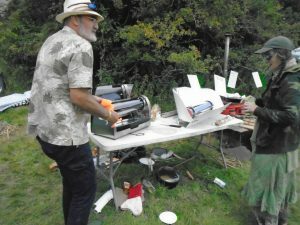 I was also able to display a number of panel cookers in operation, (the best operation was the Lightoven), and my old faithful the Sun Oven, which after strong use for years is looking battered, but still heating up nicely. 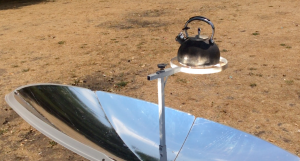 The solar cookers need regular aiming in winter, the suns position changes fast in the sky, as the earth rotates. I also had to watch out for shadows sneaking in, as the sun dipped at noon. 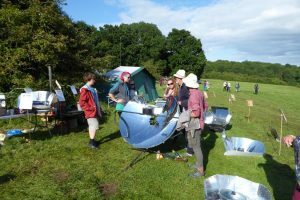 Visitors were very interested indeed, the majority having never seeing a solar cooker before. 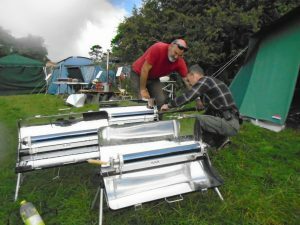 People twigged to the idea of using a fireless cooker with a rocket stove and a solar cooker in combination. 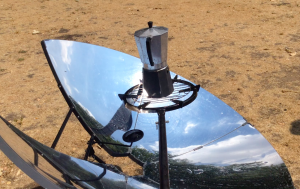 This allows 24 hour low impact, zero fossil fuel options for cooking. 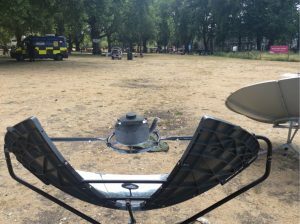 Were not trying to say we should do this at all times, but we can work together to raise awareness of options for direct solar cooking whenever possible, off grid, in the garden, wherever. 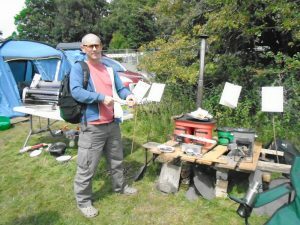 By doing this we’re encouraging uptake elsewhere in the world, amongst those who have little choice but to burn wood from endangered forests. 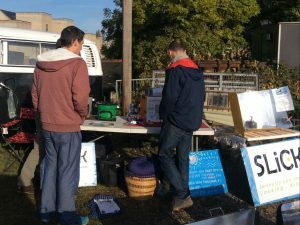 Event attendees were highly aware of these and other environmental issues. 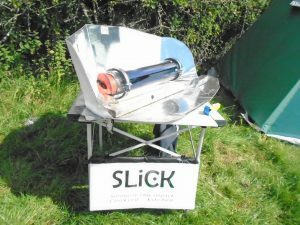 So close to mid-winter (5 weeks hence) and at 52°N it was for me a great opportunity to demonstrate the suns power and to counter the often heard fallacy that solar cooking isn’t possible in the UK. If I can do this in November, summer will be a scorcher! Our thanks to the people of Cambridge and those who set up a great event. 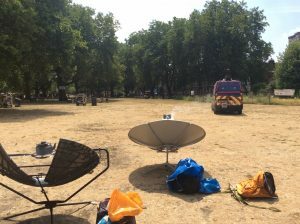 Hope its sunny next year too! This entry was posted in Ecozoom UK on December 14, 2016 by ecozoomuk.